This professional nail-art kit from PointZero Airbrush includes everything needed to create gorgeous, looking designs. 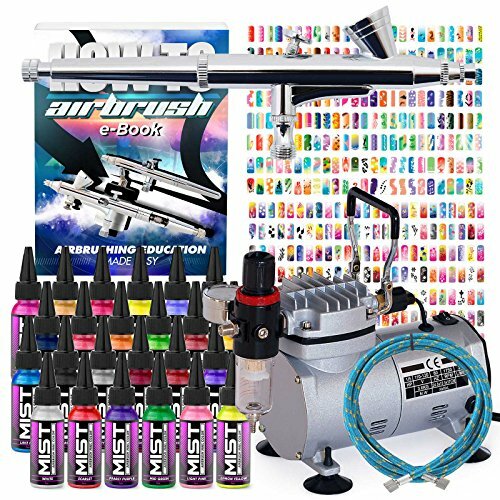 The package features an Elite-125X air compressor and PZ-270XS airbrush from PointZero. The Elite-125X is an oil-less airbrush compressor delivers excellent power (1/5 horse) with very little noise (55 db). Sensitive, diaphragm regulator with integrated pressure gauge and water-trap allows precise control and delivery of clean, dry air. On-demand operation; the compressor runs until pressure reaches approximately 58 psi, then it cycles off until the pressure drops to 40 psi, where the unit restarts. Compact and lightweight (8 lbs.) with easy-carry handle. The PZ-270XS is a premium, dual-action (trigger independently controls release of both air & fluid; pressing trigger releases air, pulling back releases material), internal-mix airbrush. Tight-tolerance head provides razor-sharp detail. Needle backstop at the rear of the airbrush allows you to pre-set the trigger travel. Gravity-feed 2cc color cup; won't obstruct your view during fine detail work. Also included are 40 individual stencil sheets, each with approximately 12-13 designs, totaling over 480 different patterns. The semi-transparent material allows you to visually place the stencil exactly as desired on the nail. These durable stencils are easily cleaned with water and can be used repeatedly. The 24 color, airbrush-ready, nail-art paint set is formulated with premium pigments and high-grade, acrylic resin polymers for vibrant luster and unrivalled coverage. Water-based and non-toxic. Three sets of interchangeable nozzles, caps and needles (0.2mm, 0.3mm and 0.5mm), a 6' braided air hose, barbed hose connector, quick-disconnect fitting, nozzle wrench and instruction sheet complete the package. As an added bonus, included with this kit is a download link for airbrushing guides.